The 31st Helsinki International Film Festival – Love & Anarchy ended on Sunday with a sold-out screening of Russian director Kirill Serebrennikov’s SUMMER. Finland’s biggest film festival gathered more than 60 000 visitors. The 31st edition of Helsinki International Film Festival culminated on Sunday with a sold-out Closing Gala screening of Kirill Serebrennikov’s nostalgic rock epic SUMMER (Leto, 2018) at Korjaamo Kino Bio Rex. During the 11 days of the festival 164 feature films and 191 short films were screened in almost 500 screenings of which one fourth were sold out. The ticket sales of the film screenings surpassed last year’s figures. Finland’s number one film festival brought more than 60 000 visitors to cinemas, festival clubs and side events. HIFF had the honour of hosting dozens of filmmaker guests including this year’s Guest of Honour, director Spike Lee, film star Shia LaBeouf with the art collective LaBeouf-Rönkkö-Turner’s film #TAKEMEANYWHERE and AMERICAN HONEY and the come-back guest Stephan Elliott (THE ADVENTURES OF PRISCILLA, QUEEN OF THE DESERT and SWINGING SAFARI) who attended the 7th HIFF in 1994. Alongside the opening and closing films COLD WAR and SUMMER, the festival’s audience favourites included Boots Riley’s absurd comedy SORRY TO BOTHER YOU, Nicolas Cage’s mad action mayhem MANDY, anime films MIRAI and MARY AND THE WITCH’S FLOWER, U.S. indie films FIRST REFORMED and LEAVE NO TRACE, Kenyan LGBTQ+ drama RAFIKI, the Palme d’Or winner SHOPLIFTERS, Oscar Wilde biopic THE HAPPY PRINCE, Lars von Trier’s serial killer epic THE HOUSE THAT JACK BUILT, the Swedish fantasy drama BORDER, teenage trans-girl movie GIRL and zombie high school musical ANNA AND THE APOCALYPSE. The HIFF Audience Award, organised in collaboration with the National Audiovisual Institute, went to Boots Riley’s SORRY TO BOTHER YOU. Oakland rapper turned film director, Riley’s debut feature is an absurd comedy about capitalism, race and right and wrong choices. SORRY TO BOTHER YOU will be screened five times in cinema Orion in November: 3.11., 6.11., 18.11., 21.11. and 30.11. The second Cut to the Chase – R&A Shorts sub-festival awarded Virva and Vuokko Kunttu’s short documentary STAR SHAPED SCAR with the R&A LIFT Award. The jury gave its special mention to Tia Kouvo’s short film FAMILY TIME. Jan Ijäs’ short documentary WASTE NO.1 MONEY won the Audience Award. R&A Shorts again drew a record audience, gaining altogether more than 2 800 visitors. The R&A Shorts National Competition screenings were especially loved by the audience. The Love & Anarchy Tour brings a selection of festival favourites to approximately 20 locations after the festival. The tour films include among others the Icelandic HIFF guest Ása Helga Hjörleifsdottir’s THE SWAN, the documentary about American pioneer of women’s rights Ruth Bader Ginsburg RBG and the newly digitized Studio Ghibli classic KIKI’S DELIVERY SERVICE (1989). During the tour, HIFF films will screen among other places in Turku, Oulu, Kuopio, Hanko, Kauhava and Vaasa. The tour schedule will be updated at the HIFF website hiff.fi/kiertue. A selection of films from the 31st HIFF programme will be shown on Yle’s TV channels. Among many of the Finnish films, A PARIS EDUCATION will be televised on Teema’s Film Festival in late 2018. 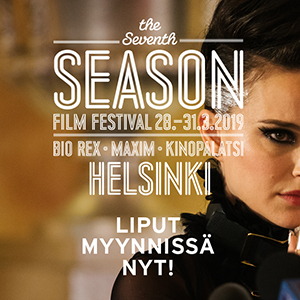 The 32nd Helsinki International Film Festival will be organized on September 19th–29th, 2019.